At last! it's a book! Thank you to Grey Townsend for the amazing, swift, and GORGEOUS work on the covers and interior illustration. Thank you to Nagasiva Yronwode for helping in every way. We are accepting pre-orders -- if you are okay with waiting. We really appreciate pre-orders, because they help us with financing special little books like this. The SKU is BOO-GRI-BAWM and the cost is 9.00 plus our standard shipping (which is admittedly high, because most orders are very heavy, due to glass bottles). It will be listed at Amazon, with a lower shipping rate, in early January. Thanks for the pre-orders, friends! Well, you may THINK you have it ... but you are in for a big surprise. No matter which of the various editions you have, there will only be between 30 and 35 spells in your copy. But if you were to assemble ALL of the editions and eliminate duplicate spells, there would be more than 50 spells! -- 53 in this edition, to be exact. It's a hard sell to explain to people why they might want to purchase "a second copy" of this famous grimoire of folk-magic, because everyone thinks they already have the book -- but they've got only a part of the puzzle. Trust me on this one. I would not have spent 5 months on it if i did not think it was worth the effort. The Chronological Bibliography, included on page 96 of the book, tells the story of what i have done. Plough, Abe. Genuine Black and White Good Luck and Dream Book, The Black and White Company, c. 1925. Source for this book’s cover. Laveau, Marie, [George A. Thomas], The Life and Works of Marie Laveau. N.P. [Crackerjack Drugstore? ], N.D., circa 1928. No copy found. Unknown page-count. Contents unknown. Presumed by Carolyn Long to be Hurston’s source. Hurston, Zora Neale. “Hoodoo in America,” The Journal of American Folk-Lore,” Vol. 44, No. 174, Oct.-Dec., 1931. 98 pages. Contains 30 Consultations and Marie Laveau (misspelled Leveau). No Note, Spiritism, Candles, Cards, Zodiac, Wedding Anniversaries, or List of Supplies. 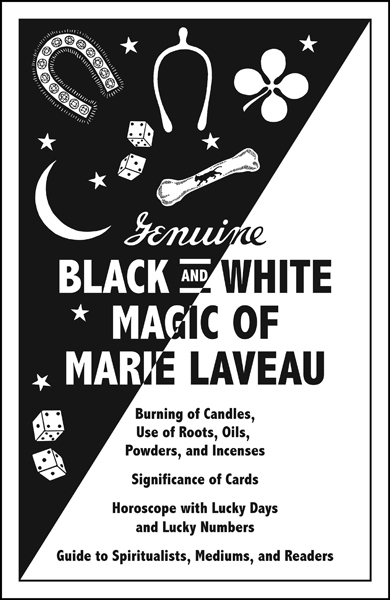 Laveau, Marie [Anne Fleitman] Old and New Black and White Magic: Marie Laveau. Fulton Religious Supply, N.D. c. 1965. 48 pages, abridged from the 1940 edition of “Old and New,” pagination in typewriter type. Contains 33 Consultations, Spiritism, Marie Laveau, Candles, Zodiac. No Note, Cards, Wedding Anniversaries, or List of Supplies. Laveau, Marie [Dorothy Spencer]. 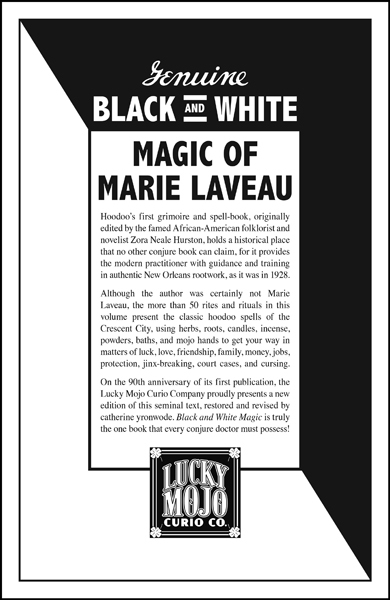 Revised Black and White Magic: Marie Laveau. N.P., N.D, circa 1985. 64 pages. Contains 35 Consultations, Note, Spiritism, Marie Laveau, Candle Novena, Significance of Candles, Candle Devotion, Cards, Zodiac, and Wedding Anniversaries. No List of Supplies. This replaced the “Attributed” edition and was offered in catalogues as late as 1990. Laveau, Marie [Dorothy Spencer]. Original Black and White Magic: Marie Laveau. International Imports, 1991. 70 pages. Reprints the 64 page circa 1985 “Revised” edition, with ads at end. Laveau, Marie [Dorothy Spencer]. Original Black and White Magic: Marie Laveau. Indio Products, 2001. 66 pages. Reprints the 64 page unattributed circa 1985 “Revised” edition, with ads at end. Well, that is interesting. I actually posses two of the editions you have listed above. I never read them closely enough to notice how different they were. After scanning over your bibliography, I found my copies, opened them up and compared them. Apparently I own the Fulton Religious Supply edition and the Attributed edition. The latter I recall buying via mail-order from Tyrad, which was, as I recall, a part of Marlar, or vice versa. Fascinating! I think I shall order a copy of the new Genuine edition when it is available at Amazon (sorry; their shipping prices are lower than yours), and I sincerely hope that it will be the last copy of this charming and highly useful grimoire I shall ever need. That gave me a smile -- yes, that is a good analogy -- also remember -- new, never before seen scenes, and the diirctor's cut voice-over! LOL!